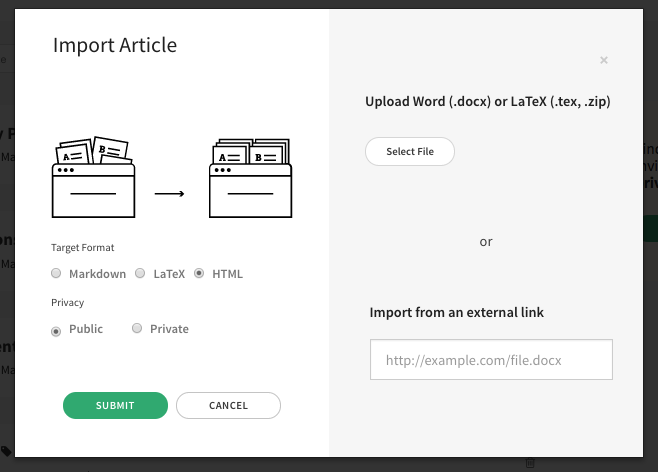 If you want to import a Word Document, select it. Make sure it is a .docx file. If you want to import a LaTeX Document, package your entire document in a zip file. Include in it, one master .tex (LaTeX) file, a bib (bibtex) file for bibliography and all the figures. If you include .cls or .sty files, the importer will attempt as much as possible to respect these rules, but bear in mind that Authorea converts all LaTeX to a HTML representation, so a lot of style and class commands (meant for printed documents) will be ignored. Authorea&apos;s importer is undergoing continuous improvement. If you have an issue uploading a particular document, please report this via the Authorea help chat along with a link to the original document.